If you want to see JSF and Spring working together, check out AppFuse. But, AppFuse also uses acegi, hibernate, sitemesh, and a bunch of other little packages. You probably should use most of them too, but you might not have realized it yet. So, until you do, you could start with an absolutely bare bones Hello World project to help you jumpstart your configuration. Here is my JSF-Spring Hello World example: [download]. You’ll need the latest versions of Maven and Tomcat. Unzip. Run “mvn”. Drop the war (or exploded war) in Tomcat. Start her up and hit http://localhost:8080/example/test.faces. If you don’t understand those instructions, you came to the wrong place. Try a JSP Book or two. mvn -Declipse.workspace=<path-to-eclipse-workspace> eclipse:add-maven-repo (see Maven Eclipse guide). 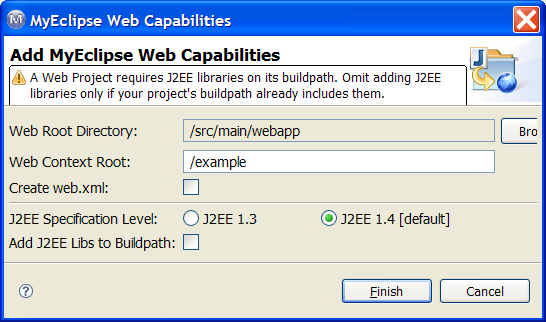 Select the project and use the menu bar (or right click it and use the context menu), MyEclipse > Add WebProject Capabilities…, set the Web Root Directory to /src/main/webapp, set the Web Context Root to whatever you want, do not create web.xml, do not add J2EE Libs to Buildpath. MyEclipse > Add Spring Capabilities…, select no libraries, Next, Specify the existing configuration file: src/main/webapp/WEB-INF/applicationContext.xml, Finish. MyEclipse > Add JSF Capabilities…, JSF Implementation: MyFaces 1.1.1, uncheck the Install checkboxes. September 13, 2006 12 Comments. September 13th, 2006 at 3:58 pm. Permalink. Maven is simple to use. It will download the required jars for you. September 13th, 2006 at 4:04 pm. Permalink. September 13th, 2006 at 4:05 pm. Permalink. Is it mandatory to use MyFaces. My plan was to implement Hello World application with JSF 1.1_01, Spring 1.2, Tomcat 5.0.28. September 13th, 2006 at 5:42 pm. Permalink. September 13th, 2006 at 6:10 pm. Permalink. September 13th, 2006 at 6:14 pm. Permalink. September 13th, 2006 at 7:52 pm. Permalink. September 13th, 2006 at 10:21 pm. Permalink. September 23rd, 2006 at 5:46 pm. Permalink. Some dependencies may not have source available. No big deal. If you want it in Eclipse, you’ll have to download it from somewhere else. Also, in my experience, Maven tends to fail in a lot of the downloads. Try again and see if it doesn’t get further the next time. September 23rd, 2006 at 8:07 pm. Permalink. what is governing the path when maven runs? September 23rd, 2006 at 8:20 pm. Permalink. Also, you don’t have to use the .classpath the Maven creates. If there are some dependencies that Maven can’t give you (which shouldn’t happen), then you can download those yourself from elsewhere and set up Eclipse’s classpath. September 23rd, 2006 at 8:54 pm. Permalink.